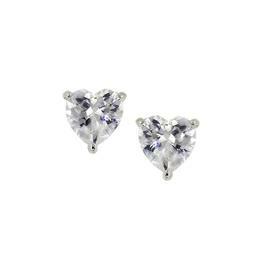 CZ - RHODIUM HEART STUD. Blue Luster is our line of Brass based jewelry. Each piece is plated with Genuine Rhodium (one of the strongest and most valuable precious metals on earth) and 18 Karat Gold with hand set top quality Cubic Zirconia stones.